Much has been said about Jens Keller in recent weeks and months. There was criticism and there was praise. During the last few weeks Schalke had numerous good performances after a long dry spell and was able to recoup some lost credit with the fans. Schalke’s way of playing, by now typical, was well visible during long stretches of this game: simple, fairly stable and putting the focus on just a few aspects. Most interesting is probably Raffael’s way of playing as nominal ten. Once again he was varying pressing. 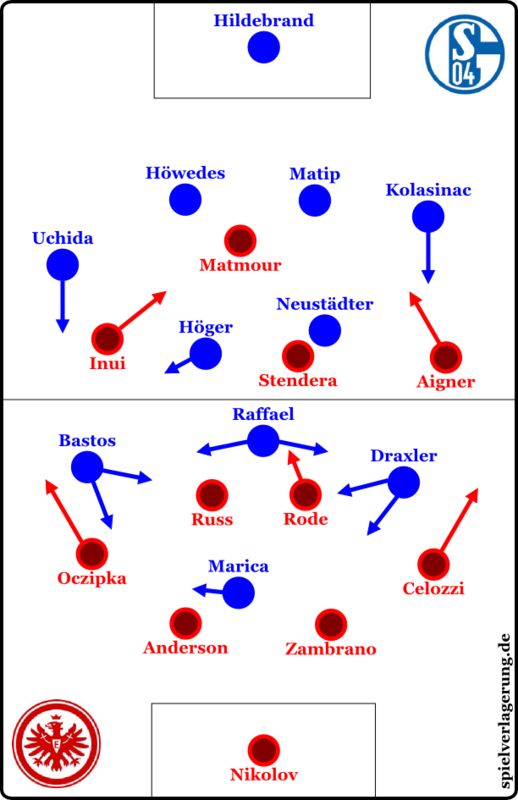 Instead of the expected 4-4-2 pressing against the Frankfurt centre backs, Schalke used a 4-4-1-1, in which Raffael was conspicuously often adapting to central midfield. He aimed at improving central compactness and defensive stability. The interplay with Höger made this way of playing interesting. Höger frequently tilted to the right to cover Uchida. The Japanese can then advance and overload the flank, while Bastos as right winger drifts infield. In addition, either Raffael or centre forward Marica moved to the right, opening space for Bastos in the process. On the other hand, nothing much happens on the left flank. Julian Draxler is the sole source of entertainment here, looking for scoring opportunities coming down the left flank and running towards the middle. Keller heightens the attacking potential by allowing Kolasinac to advance, but against Frankfurt this was not particularly effective. Eintracht had had a reserved six in Russ, Aigner and Inui are similarly capable defenders and Rode returns reasonably swiftly. The middle was rarely open to Schalke, who had to finish most of their attacks by playing on the flanks, creating a few opportunities, but only rarely quality chances. Schalke was lacking connections in the centre. Raffael had a tough time against Russ and Rode, the former man marked him, depending on the situation. Höger mostly tilted right and Neustädter had to cover a huge area in middle alone. The Eintracht was well adapted to Schalke and Neustädter in particular. Even though Eintracht employed a 4-4-2 pressing, they did not press the centre backs either. Stendera and Matmour positioned themselves next to Neustädter instead, the latter slightly higher up the pitch. Höger could often be found in the right defensive half-space, where Inui got between Uchida and Höger. As a consequence Schalke’s build-up suffered. Neustädter never had much space to make good, strategic passes. Höger received many balls, but was well run at. In the end Schalke advanced with passes to the right flank and attacks from there. Raffael had problems with being outnumbered in the centre, as has already been mentioned. Besides, Rode frequently moved up a bit during pressing while Russ stayed deep. Frankfurt created more pressure that way and was relatively safe, die to a lack of movement in the centre and the occasional man marking of the Schalke wingers and Marica. Due to their superior scaling, Frankfurt was collectively stronger when fighting for second balls, even if Schalke tackled better at the start of the game and was able to deny a few attacks, mainly through the very active Inui. Eintracht presented themselves well offensively, too. Passing was strong and fluent. The very young Stendera (born December 1995) performed as well. His chief purpose was to open spaces in the middle and to aid combinations. His technique and running were convincing and his set pieces were frequently dangerous. Changing the way to play in attack, with fewer long balls, made Alex Meier’s absence inconspicuous. Additionally a slight asymetry could be seen on the wings. Celozzi and Aigner were overloading the right flank, the former making a number of interesting diagonal runs and exploiting the space behind the fluid Draxler. On the left Ozcipka ran past Inui, who was also supported by Stendera and the drifting Matmour. Frankfurt lacked precision a number of times, but the Eintracht’s play and tactics were superior, at the latest during the final part of the first half and after Rode started to advance more frequently. Jens Keller and his men were trailing again and in need of a comeback, a situation which they had successfully solved against Bayer 04 Leverkusen. After the break there were some quick changes again: Kolasinac advanced far more frequently and used his impressive athleticism in backwards pressing to avoid a major impact on stability. Bastos and Draxler switched sides a few times and there was more Schalke fluidity in the half-spaces in general. 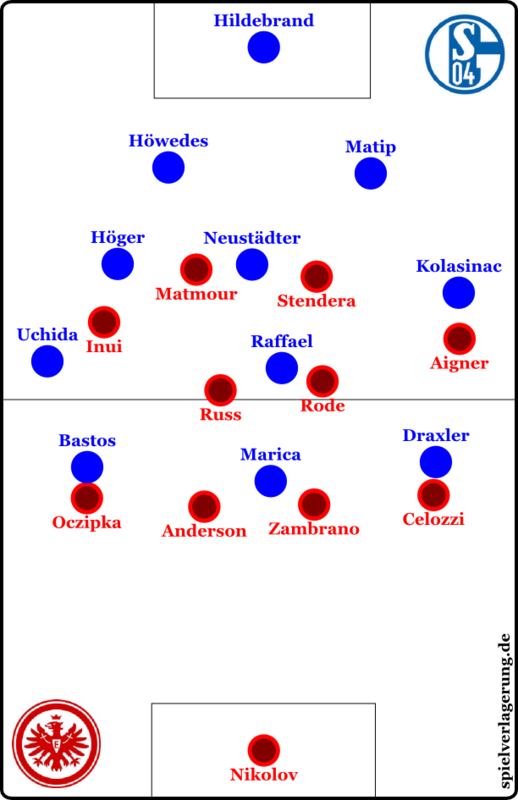 In Minute 64 Keller substituted Neustädter for Jones, enabling more mobility: Jones tilted sometimes, advanced frequently and even drifted to the flanks. The intention was clearly to improve Schalke’s offensive potential. Barnetta was introduced for Bastos on the right as a strong dribbler. None of the measures were genuinely effective. Schalke had more play and more opportunities, but all in all creativity in the centre was still lacking and the substitutions did not repair the damage. Frankfurt was pushed back however and mainly threatened on the break. Celozzi, who advanced continually, and Stendera, who showed a few good shifts of play, were convincing. In general the Eintracht had the more complete game and took to crosses and short passing combinations more frequently in order to reach their goal. Lakic for Matmour was supposed to make this way of playing even more effective, but it did not. Höwedes going forward during the final minutes seemed like an act of desperation on the part of Schalke. The game as such gathered pace after the break and was interesting, in spite of the sole goal, even if there were no changes tactically. The most interesting interplay was probably the effect of Frankfurt’s game plan on Schalke’s centre and the players’ reaction to the changing rhythm. From time to time Frankfurt was pressing, sometimes Schalke, but only Eintracht achieved a clear superiority during the final part of the first half. Schalke was lacking creativity and diversity of ideas in attack. Original Text by RM. Translation by FI. Spielverlagerung thanks FI for his again outstanding work. There are probably more mistakes in my thanking than in his translation.